WASHINGTON (The Nil Admirari) - Today, the largest corporate media outlets in the United States confessed they were purposely ignoring U.S. Senator Bernie Sanders of Vermont - a Democratic presidential candidate - as much as they could. The corporate media syndicate asserted Sanders was "too serious" about running for president, and his focus on all the negative characteristics of the United States made him "too pessimistic and objective" for an American public that must focus on being afraid of terrorism, conformity to the status quo, celebrity drama, and Republican presidential candidate Donald Trump. "If Bernie Sanders could tone down his objective look at the United States, maybe he would get more time with the American people. Sanders may be attracting the largest crowds of all the presidential candidates, but we won't encourage such a pessimistic view of America when everything is already great," declared Arnold Titan, an intern speaking on behalf of CNN, NBC, ABC, CBS, Fox, and many other American propaganda outlets. RELATED: Hillary: Sanders Giving Poor & Middle Class "Too Much Attention"
Titan added, "Do any of you know about an epidemic of meth addiction in the United States? Of course most of you don't, because things like that are not really important to us. This is a new golden age of yellow journalism where we distract Americans with sensationalist lies while ignoring facts and promoting conformity to the current system." 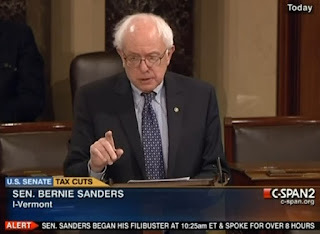 "So it's a nonstarter when Bernie Sanders talks about healthcare for all Americans, repairing and updating America's crumbling infrastructure, saving the middle class from worsening income inequality, and a whole host of other very serious topics. We'll just cover Trump, or the latest mass shooting or celebrity gossip," explained Titan. CNN Senior Political Reporter Nia-Malika Henderson asked Titan if Bernie Sanders still had time to repent for his "everything-is-awful" brand of politics, and get the corporate media syndicate to pay a little more attention to him. RELATED: Psychic Warns Hillary Clinton of "Horrible Berning in 2016"
"Sure, there is still a little time. As of right now, though, a bear running loose in a suburb, or a viral cat video are things that have priority over Bernie Sanders and his hate speech for America," replied Titan.